A lucid portrait of the enigmatic French writer and mystic. With this volume, Gray (At Home with the Marquis de Sade, 1998, etc.) adds to the considerable success already achieved by the Penguin series of brief biographies. 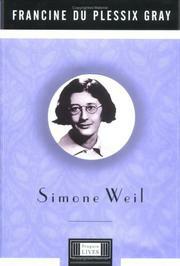 Weil makes for a challenging subject: Her writing is relatively unknown in the US, and in many respects her life was her most ambitious work. Born into a prosperous Jewish family in 1909, she eventually found fulfillment through a combination of extreme asceticism, solidarity with the working class, and Catholicism. At 16 she wrote, “Sacrifice is the acceptance of pain, the refusal to obey the animal in oneself, and the will to redeem suffering men through voluntary suffering.” And suffer she did: lifelong migraines, anorexia, and a tendency—perhaps subconscious—towards self-mutilation. As Gray observes, for Weil “the cult of self-mastery could all too readily become self-destructive.” Despite her cultivation of personal misery, Weil achieved a great deal. A brilliant student, she went on to considerable success as a schoolteacher, and offered free courses to working people in her spare time. She also spent a year working in various factories, where she attempted (with increasing disillusionment) to help the workers organize. Despite her sympathies with the working class (and her service with the Republican forces in the Spanish Civil War), Weil was an early critic of Stalin and the Communist Party. Her position reflected a deep suspicion of power: A keen student of Machiavelli and Hobbes, she realized that those in power, whatever their professed beliefs, quickly become concerned primarily with self-perpetuation at the cost of social advancement. Towards the end of her brief life (she died at 34), Weil became deeply attached to Catholic doctrine, but she was reluctant to identify herself with any religion and deliberately chose not to be baptized. Many of her most important essays date from her final years and concern her search (never fully realized) for redemption. A superbly nuanced portrait of a tortured character.